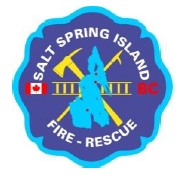 In 2013 the Salt Spring Island Fire Protection District (“District”) undertook a detailed design and costing for a new Fire Hall to replace existing facilities. The District did not proceed further because the necessary borrowings to build the proposed facility were not approved by the electorate. The District has decided to again review the adequacy of its Ganges Fire Hall No.1 and make recommendations for reimagined fire hall facilities. The District is in the process of engaging an outside consultant to chair the “New Fire Hall Advisory Working Group” (“Advisory Group”) – a select committee of the Board of Trustees tasked to develop recommendations regarding the provision of a new fire hall and associated fire protection services. The District is requesting proposals for consulting services to develop and implement a communication/public engagement plan that will support the work of the Advisory Group. Plan how to respectfully and appropriately respond to contrary viewpoints or mis-information.